Leigh Jamieson is sent crashing to the ice to earn Phantoms a penalty shot against Swindon. Photo: �2017 Thomas Scott. All rights reserved. The biggest game of the NIHL Division One South season so far came complete with a dramatic conclusion last night (October 21). Leigh Jamieson was the man to provide it 42 seconds into overtime as Peterborough Phantoms continued their 100 per-cent start by triumphing against Swindon in a top-of-the-table showdown at Planet Ice. Phantoms' Ben Russell and netminder Adam Long combine to prevent Swindon Sam Bullas from scoring. �2017 Thomas Scott. All rights reserved. Slava Koulikov’s men eventually prevailed in the first of five additional minutes after the two sides, who are certain to be rivals for the title, were left deadlocked after an hour of engrossing hockey. Phantoms were the better team despite twice failing to hold onto leads provided by the excellent Owen Griffiths and defenceman Robbie Ferrara. But Jamieson, who was wrongly credited with his side’s second goal by the match announcer and then fluffed a penalty shot early in the third period, did deliver the decisive strike. He was the beneficiary of some fine work from Nathan Salem who darted from his defensive zone to beyond the Wildcats’ net before laying the puck perfectly into the path of his fellow summer signing to guide past visiting netminder Renny Marr. Phantoms' star Leigh Jamieson celebrates his winning goal in overtime against Swindon. �2017 Thomas Scott. All rights reserved. 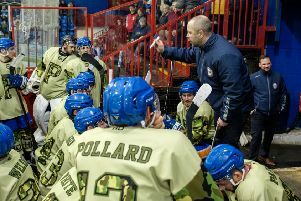 Phantoms head coach Koulikov said: “The boys fought hard for 60 minutes and continued to believe even though Swindon twice got themselves level. “Everyone was needed and everyone did their bit. Our netminder played well, our defensive coverage was good, and we looked dangerous offensively. “Confidence is high and I’m sure everyone connected to the organisation is proud of where we’re at. There is a still a long way to go, but we couldn’t have done any more than win our first eight games and we have showed we are contenders. “But there will be many important ones ahead. We still have to play Swindon another three times, Bracknell another three times and Basingstoke four times. Phantoms were boosted by the return of import forward Ales Padelek after illness, but the Czech veteran was soon in the wars. He suffered a nasty cut above the eye after being on the receiving end of an ugly centre-ice check from Swindon man Max Birbrear which surprisingly went unpunished. Padelek returned to the game after being patched up by the club’s medical staff and Phantoms hit the front when Griffiths struck against his former club following a smart exchange of passes with Salem. Jamieson couldn’t extend the advantage with his penalty shot early in the final period and Swindon clawed their way level a second time when Birbraer fed Luc Johnson. Phantoms didn’t make the most of numerical advantages - which included 56 seconds of five-on-three - after Swindon picked up a couple two foolish penalties in the closing stages of regulation time. But the second of those indiscretions carried over into the opening 41 seconds of overtime and the winner was conjured just as it elapsed. Phantoms return to action next weekend with an NIHL Autumn Cup home date against Sheffield Steeldogs on Saturday (October 28, 7pm) ahead of a league trip to Invicta the following night (October 29, 5.15pm).